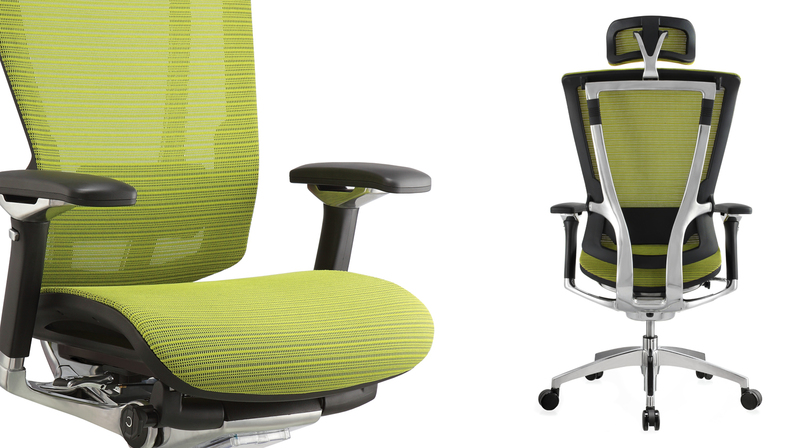 Nefil – from the manufacturer of Ergohuman – is designed and manufactured to offer a perfect mix of ergonomics and elegance. The materials used to manufacture the Nefil chair are environmentally friendly and offer the flexibility and strength to provide outstanding comfort along with refreshing good looks. Using the ingeniously simple single lever control to operate the three main chair functions – seat height, seat depth and back tilt are all operated from a single point of contact. The Nefil office chair is packed full of features including Smart Motion back technology, backrest rake adjustment, lumbar support height adjustment, seat tilt and seat depth and bodyweight tension adjustments, optional headrest and pivoting arms with height and slide adjustment. A user instruction CD is also tucked neatly below the seat. Offered in mesh or classic leather with a contemporary aluminium frame and base, the eco-friendly Nefil chair is 97% recyclable, has Greenguard Air Quality Certification, and meets EN 1335-2:2009 and EN 1335-3:2009.